In middle school I had a bit of trouble getting up in the morning. At first my mother would come downstairs (my room was in the basement) and bang on my door to wake me. After a while when that didn’t work she installed a bell. I still remember that horrible sound – one high pitched beep followed by a lower pitched beep. It was an awful way to wake up. I found myself scrambling around trying to pick out clothing, eat breakfast, and make it to the bus stop on time. It was not unusual for me to arrive at school and realize that I had not packed my gym clothing. Or my library book, or my homework. One weekend my grandparents were visiting and my grandfather suggested that I start preparing for school the night before. Because it was my grandfather I took his advice more seriously. Ever since then I have had a nighttime routine for myself. In college, I laid out my clothing and set my alarm. As a single girl I did those things, but I also packed my lunch for work. And now as a mom/homemaker/professional I do all of that and more. My Philosophy: The less thinking I have to do at 6 am the better. Every night after dinner is served I put any leftover food into a container and refrigerate. I do this so that I can start cleaning up the kitchen as soon as we are finished eating. Next, I load the dishwasher and hand wash anything that I need to. Cleaning out my sink is important, because a sink filled with dishes makes me feel stressed. Chaos in the environment is chaos in the mind. For more on Shining Your Sink check out FlyLady. After that I take Clorox/Lysol wipes and wipe down the table and all of the counters. Lunches and work snacks are prepared, as well as the coffee maker. 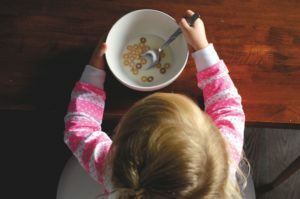 If breakfast is tough for you in the morning, pull out your cereal, bowls and other items the night before too. At this point the kitchen is closed. If the Hubs needs a snack he is responsible for putting the dishes in the dishwasher so they are not sitting out in the morning. In a perfect world we would all take 15 minutes each night to do some light decluttering. I wish that I could say I do this every day…it’s more like every other day. But I always go through the mail. Mail is a big source of clutter in most houses. Take the time to sort through the day’s mail. Toss the junk and file the bills/important stuff where you know you can find it. Check out my post on 12 Cool Products to Organize Your Kids Stuff . Alternatively, you could take a few minutes to gather up the laundry from each member of your family and carry it to the laundry room. If you have clean laundry that needs to be put away, you can use the time for that task, too. Get the HealthyADHD Evening Checklist! I allow my son to choose his own clothing so he puts his outfit on the table next to his bed. He knows he needs some pants, a top, underwear and socks. This can be done quickly right before his shower. If you prefer to pick out your children’s clothing do so the night before and put it in a designated spot. This prevents the kids from wasting time going through the drawers and making decisions about what to wear. For some kids that process is just too overwhelming. While my son showers I lay out my clothing for the next day. Make sure you lay out everything, even socks and shoes. Visually, this can be annoying because it looks like there is clothing spread all over the room. But do it anyway. You’ll be glad you did in the morning. I know this is a bit controversial. When I was teaching I had to be in my classroom by 7:15 a.m. so I started showering at night after dinner. This switch in my personal habits made a huge difference in my mornings. My advice is to try it for a week and see what you think. You might be surprised how relaxing a hot shower is before bed. And when you see how much time it saves you in the morning you will be stunned. In this house bedtime is not negotiable for the children or the adults. It is rare for my son to be up past 8:30 p.m. and even more rare for the Hubs and I to be awake at 10:00 p.m. Sometimes when I read I can make it til 10:15, but not often. If you are trying to make your mornings run more smoothly then you need to be able to get out of bed on time. The only way that will happen is if you get adequate sleep. For more on reading and why it is so important see This Article. Or This Article. Moral of the story is – use your time in the evening to set yourself up for success the next morning. If you do some basic prep your morning will be soooo much easier. Need help coming up with a solid evening routine? 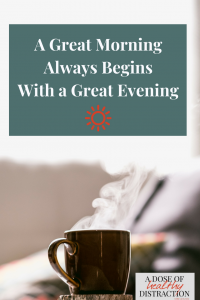 Check out my 1-page Evening Checklist!